Floyd Mayweather, retired American professional boxer, says he will be making an appearance at Club Rumors, a nightclub owned by 2baba. In a post on the nightclub’s Instagram page, Mayweather said he will be at the Victoria Island branch of Rumors from June 12 to 14. “It’s the one and only Floyd Mayweather. Nigeria, June 12th, June 13th, June 14th Nigeria, the motherland prince, I’ll see you guys soon,” the 40-year-old said. 2baba opened the first Rumors branch in 2012 after purchasing the building of former La Cachette Nite Club in GRA Ikeja. In 2014, the African Queen singer opened the Festac extension of the club, which was estimated at N250 million. In October of the same year, 2baba opened the third branch of his nightclub in Victoria Island. 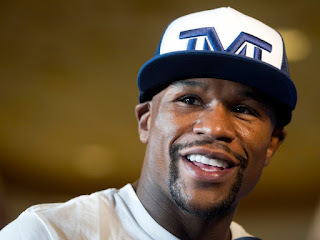 Mayweather is considered to be one of the greatest boxers of all time as he has won fifteen world titles. Born into a family of boxers, Mayweather has announced his retirement twice. The first time was in May 2007 while his second announcement was in December of the same year. He finally retired in September 2015. There are talks of a potential comeback for a fight with Conor McGregor.